It is time to say goodbye to 2015 and welcome 2016. New Year wishes, greetings and celebrations are on its way. And, so are New Year resolutions and predictions. Quick Heal family wishes you a Merry Christmas and a safe and secured New Year 2016. 2015 was an eventful year for Quick Heal. 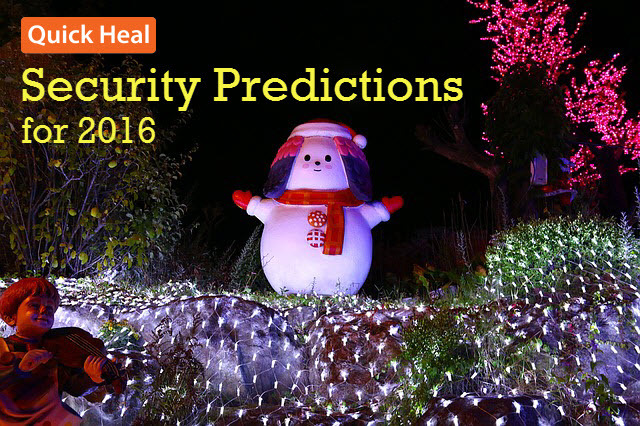 The IT security market witnessed some landmark events that will have an impact in 2016 as well. So, if your eyes are on the latest Android and iOS devices or if your work requires a high degree of technology influence, then follow these developments closely. Android and iOS Vulnerabilities are on the Rise! In my last article, I had mentioned about how Android and iOS riskware and malware attacks affected over a billion users worldwide. Leading manufacturers were prompted to release regular security patches. Bugs like Stagefright and Certifi-gate made the headlines at international security conferences. 2015 was an engaging year for security experts as they reported significant vulnerabilities in Android and iOS devices, but none of them have been exploited in-depth. So, if you think 2016 is a good time to invest in laptops and latest mobile gadgets, remember it is a tempting year for hackers as well. And, Android lovers, hackers find you easier to target than iOS. Unfortunate, but true! So, you have a new and technology-driven office. That’s good news! You believe in employee flexibility and encourage Bring Your Own Device (BYOD) policy at workplace. But, have you invested enough in securing your office from cyber threats? Quick Heal experts have identified that though small offices and home offices (SOHOs), SMBs and enterprises are adapting to technological changes, they are minimally equipped to protect their office systems and networks from cyber threats. It is only recently that enterprises and small business are allotting a major budget for cyber security. Weak security has direct impact on business operations. This impact can be as major as losing proprietary intellectual property or worse, customer trust. Cyber criminals find small businesses an easy target because of their lack of understanding of cyber-attacks. Ransomware, for instance, is one of the most potential tools for cyber criminals and powerful enough to even destroy a business if the ransom amount is not met. So, if you are embracing technology for your office, do not forget to invest in its security as well. Quick Heal’s enterprise brand Seqrite is designed primarily to protect SOHOs, SMBs and enterprises. Next time if you notice anything phishing, remember Seqrite is there to protect you! Ransomware is here to stay! Yes. Ransomware will be the most powerful tool for cyber criminals and will dominate 2016. Hackers will not mind releasing your sensitive data to the public if you do not pay them the ransom amount. Still confused about how ransomware can affect your work, business and life? Read more on the top 3 ransomware threats that are alive and victimized many here. You are the CFO? Hackers love you! A VIP spoof wire transfer is something you should watch out for in 2016. For instance, as a finance employee, you receive a mail from the CFO requesting transfer of substantial office fund. Coming from the CFO, you consider it authentic and validate the transfer only to realize that the cyber criminals trapped you in their trick! If Hackers Act, Manufacturers and Security Experts will always react! If you think hackers will only have their way in 2016, then you are partially correct. Leading Manufacturers like Google, HTC, Samsung, and Lenovo amongst others, have made significant efforts in delivering a secured cyber environment. They have joined hands to release their security updates on a regular basis and are becoming watchful while pre-installing apps. Mobile developers are taking note of such vulnerabilities earlier in the development cycle. As end users, it is important to recognize the threats and vulnerabilities and adopt measures not just to detect these threats but also prevent and fight back. Adoption of strong IT security measures. Home users should protect their PCs and mobile devices from virus attacks and other vulnerabilities by purchasing a good Antivirus Solution. Beware of spam and phishing emails asking you to claim your billion dollar prize and requesting you to share sensitive information such as bank account number, PAN and other sensitive details. SOHOs and SMBs should invest strategically in a robust enterprise solution and secure their network. It is essential for employers to train their workforce on cyber security attacks and business implications of phishing and unsolicited emails and malicious links no matter how authentic they appear. Higher management of small, medium and large enterprises have to take a significant role in protecting their organizations from cyber risks. Manufacturers, mobile developers and security experts have to begin to deliver big differences in 2016. With Internet of Things (IoT) making headlines, the role of these big players has to be more coordinated as hackers will become more alert. Data Protection Legislation has to be more defined, stricter and enforcing. Organizations should be increasingly involved in protecting consumers’ data. In the wake of a Digital India and strong international collaborations, a strong cyber security law should help create a new and bold Digital India. And as always, stay safe! I ALWAYS WANT MY LAPTOP FULLY SECURED. Thanx for tips for 2016 .Happy new year. The BEST ever antivirus I have used is QUICK HEAl. Also Thanks for useful Tips. The BEST Anti Virus I have ever used is QUICK HEAL. Best Protection. I have used Quick Heal Antivirus. thanks for great protection for Quick Heal team. I wanted to know if the QUICKHEAL INTERNET SECURITY version that I have installed in my computer is capable of dealing with threats you mentioned above. Quick Heal Internet Security gives you seamless security for your banking transactions, chats, emails and browsing. Please visit http://bit.ly/1MCJo5S to know more about the product. Thanks for writing in. Our support engineers would gladly help you with this issue. Please visit http://bit.ly/QHSupport and click ‘Chat with Us’. You can also raise a ticket at http://bit.ly/Askus and we will get back to you at the earliest. anti virece and internet securety…..
Feel good when you are secured. Thanks for all security provided. I love Quick Heal . i am using trail version but my system is safe and fast. thanku Quick Heal team. i will buy soon our product. Very good product. I am using Quick Heal in my desktop and mobile. Very nice quick Heal product. But I want to reniue it .help me . I am unable to download JAWA application. Is it because of hidden malware or Quick Heal.